Surprised by the title? 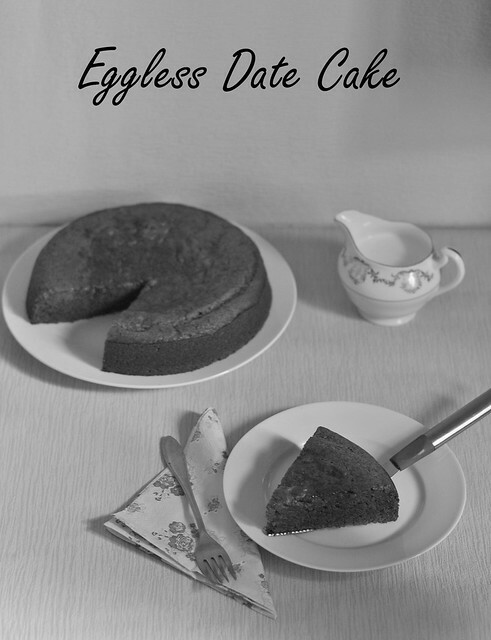 You read it right...This cake has NO EGG AND NO BUTTER ( not even a drop) And the taste? 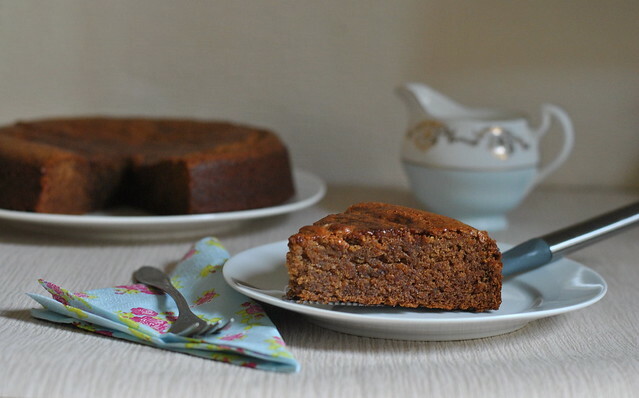 It was soo soft, spongy and absolutely delicious that I couldn't believe that it was eggless. This is my first post for Blog-Hop Wednesdays started by Radhika of Tickling Palates. And I was paired with Nagashree of Sattvaa. Actually this post was supposed to be posted on Wednesday, but sadly I couldn't. I got too busy past few days with my 5 month old baby being unwell with flu, guests visiting us and with packing and what not...Moving is always a big hassle (specially moving countries) and what with a naughty toddler and a24/7 attention seeking baby at home....things get even messier. We have just 2 more weeks left in UK :( I am sad because we are leaving Oxford and also because I have so much packing to do yet. Anyways coming to today's post I was going through Nagashree's blog and found so many regional dishes and was wondering what to cook, and then our neighbor from Saudi Arabia gave us huge box of dates. 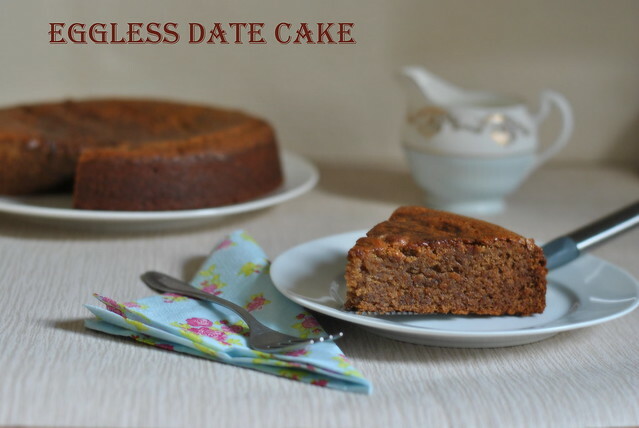 And I knew I had to finish those dates within few weeks, before we leave and as I am too much in baking mood these days I decided to bake this Date Cake from her space, which she had followed from here. And I am really glad I baked this cake. My family just loved it. I will definitely bake it again and I am planning to bake in a loaf pan next time like this banana bread. Soak the pitted Dates in 1 cup of milk overnight or if you don't have time soak them in warm milk for 3-4 hours. Preheat oven to 350 F / 176 C . Grease and line the bottom of a cake pan and set aside. In a blender blend together the dates, milk and sugar to a smooth paste.Sift the dry ingredients- Flour and baking soda and set aside. In a wide mouthed bowl add the smooth paste from the blender and now add the cooking oil/vegetable oil. Slowly add the dry ingredients to this and mix with a spatula/spoon until well incorporated or use a hand mixer for 1-2 minutes to mix everything well. Stir in the chopped nuts. Pour into the prepared pan and bake for 25-30 minutes or until a toothpick inserted comes out clean. Once out of the oven, cool completely on a wire rack before slicing. Serve it just plain with tea or you can serve it with a scoop of vanilla ice-cream for dessert. This Summer marked Queen Elizabeth II Diamond jubilee celebrations. The Diamond jubilee marked Queen Elizabeth's 60 years as queen and she is the second longest reigning monarch of United Kingdom after Queen Victoria. And it was so exciting to see people wear clothes that had red , blue and white, the street parties and the food with union jacks and crowns on it. It was a memorable event for everyone here and more for us because we will be leaving UK in couple of weeks. We will definitely miss this country and the lovely people we met here. 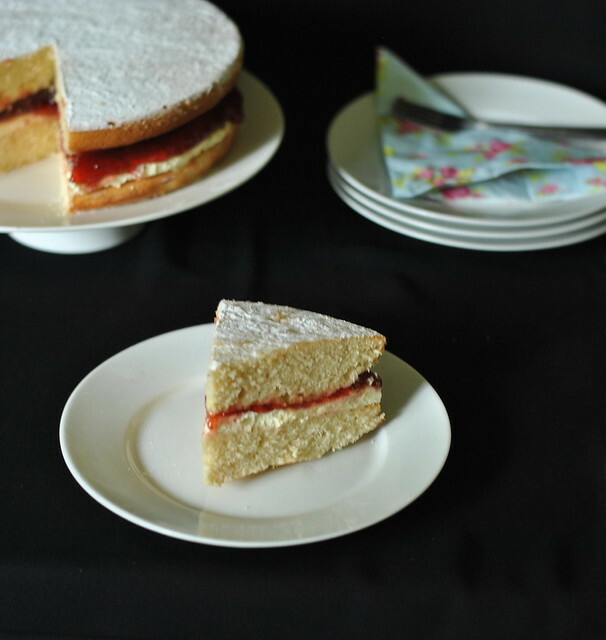 Coming to the recipe, I decided to bake the most iconic cake in Britain the 'Victoria sandwich' or 'Victoria sponge' which is named after Queen Victoria, which she loved having it with her afternoon tea. 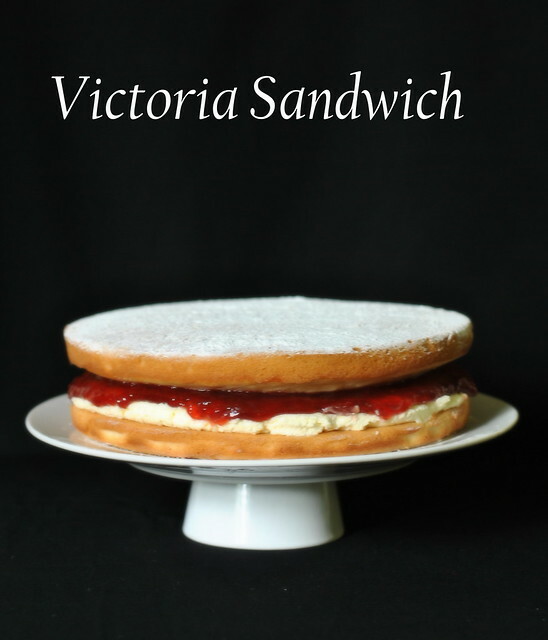 A classic Victoria sponge consists of jam and whipped cream or vanilla buttercream sandwiched between two sponges. Whenever I have bought this cake, I have found it containing the butter cream. Maybe because it will have a longer shelf life. But I opted for whipped cream filling as my son loved it. But I have also written the recipe for the vanilla cream. Pre-heat oven to 190 C / 375 F. Butter 2 sandwich tins and line it with a nonstick baking paper. In a large bowl, beat the butter and sugar until light and fluffy. Now add the remaining ingredients and and beat till well incorporated and you get a smooth batter. Divide the mixture equally between the prepared tins, smooth the surface with a spatula or the back of a spoon, then bake for about 20 minutes until golden and the cake springs back when pressed. Turn onto a cooling rack and leave to cool completely. 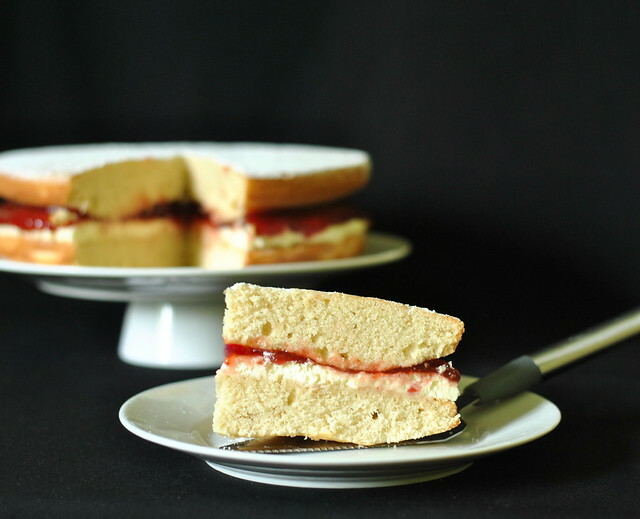 For the filling, whip the cream till soft peaks and spread it over the bottom of one of the sponges, top it with strawberry jam and sandwich the second sponge on top. Dust with a little icing sugar before serving. If you don't have sandwich tin, you can bake it in any round cake tin and slice it into layers to add the filling. There are many other options for the filling like you can replace the whipped cream with buttercream or lemon curd. And also you can replace the strawberry jam with raspberry jam. Below is the recipe for the buttercream filling. Beat the butter until smooth and creamy, then gradually beat in icing sugar and vanilla extract until you get a smooth cream. Sending this celebration cake to Jagruti's event- Celebrate Diamond Jubilee. 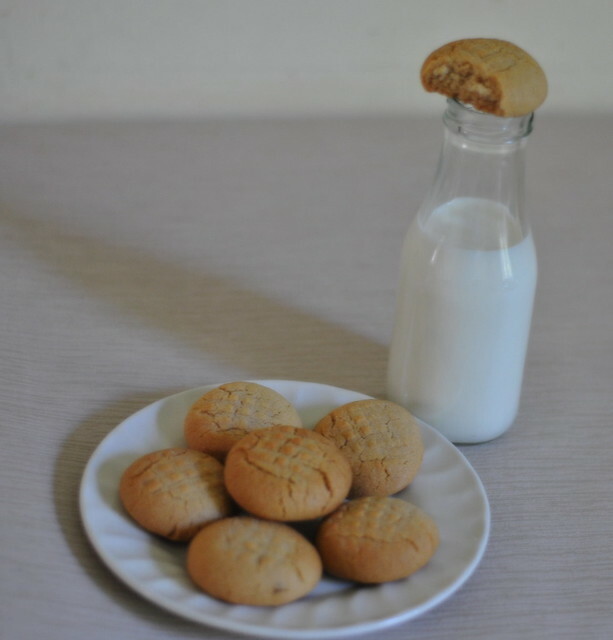 While growing up in India, I had never heard or tasted peanut butter. But I am sure many people back home know about it now.The first time I saw it was in America. And I guess Americans love peanut butter..I used to see people rave about it and PBJ (Peanut Butter and Jelly) is a favorite sandwich among most children in USA. And even my son (and me too) love PBJ sandwich now. And if you are wondering how it is made, then let me tell explain -Its just a Layer of peanut butter on one slice topped with another slice and you spread a layer of strawberry jam on that second slice and lastly cover with another slice of bread. Doesn't it sound easy ? and Its Yummy too..when you bite a slice of this sandwich, you can taste the sweet jam and the nutty and salty peanut butter and all you will say is yummmm. 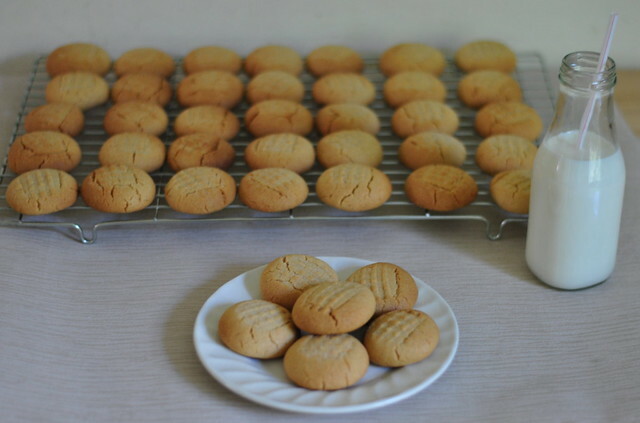 And also peanut butter cookies are very famous there. Like I said, people there love anything and everything with peanut butter in it. It had been a long time since I baked them, so baked these and also made some chocolate fudge few weeks back to take along while visiting our cousins here. And I was so glad to know that they loved it. 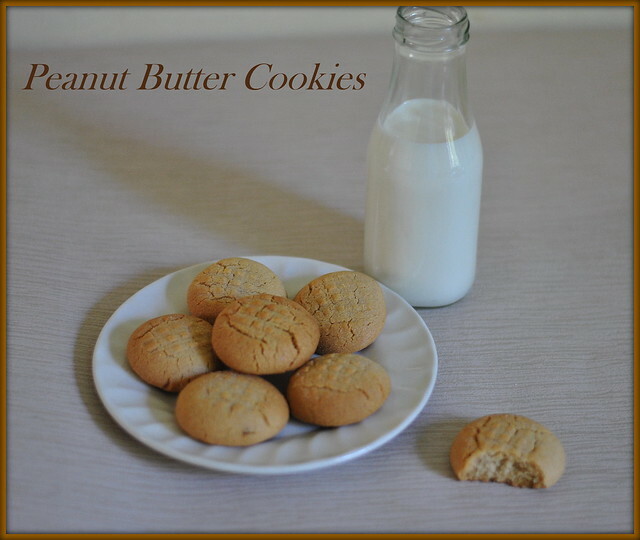 If you are a peanut butter lover like me, then this is a must try recipe for you . Using a hand mixer, beat the butter in a bowl until smooth and fluffy. To this add the granulated sugar and light brown sugar and beat for around 2-3 minutes. Now, add the smooth peanut butter to this and beat until incorporated. Add the egg and vanilla extract and beat again to mix. In a separate bowl, sieve together the dry ingredients - flour, salt and baking soda and add this to the above mixture and beat on low speed until everything in mixed well and forms into a dough. Cover and refrigerate for an hour. Pre-heat the oven to 350 F / 177 C and line 2 baking sheets with parchment paper. Roll the dough into small balls (around 1 inch) and place them on the baking sheet. Now dip the tines of a fork in granulated sugar or flour and make the criss-cross patterns on them. Bake for 10- 12 minutes or until you see the cookies turning light brown on the edges. Once out of the oven, cool on an oven rack and store in an air tight container. 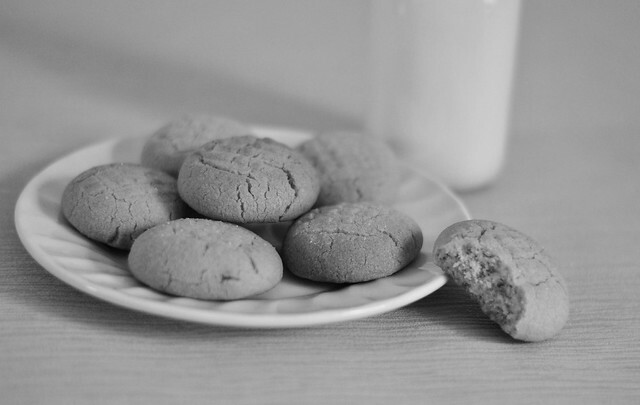 Keeping in refrigerator is not needed if you want crispy cookies. 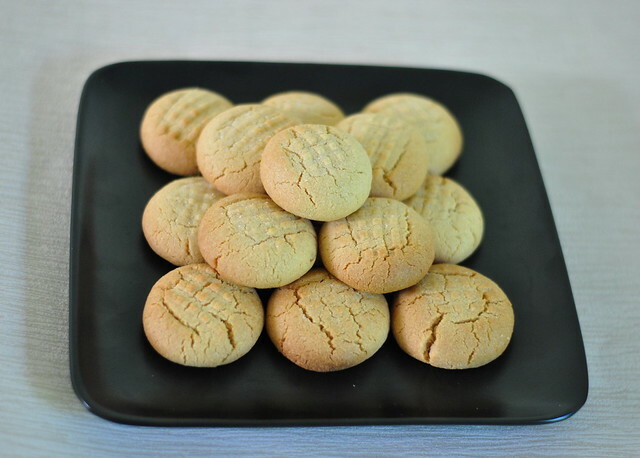 Because keeping the dough in the refrigerator will give you soft and chewy cookies. And by not refrigerating it, the dough will spread more and will yield you flat and crispy cookies. If you want you can add finely chopped peanuts or chocolate chip cookies to the dough after adding the dry ingredients. Or you can use crunchy peanut butter instead of smooth. And when you place them on the baking sheet place them 1-2 inches apart because they spread while baking.